My mum has always been famous among her friends and family for her delicious pavlova. Growing up I would look forward to special occassions when she would whip up a pav for our guests. Now as an adult, we make them together. Note: If using a gas range set the oven at hot (450 deg F / 230 deg C) immediately you start to beat the egg whites. Step 1: Beat egg whites until they stand in stiff peaks. Add sugar gradually, 1 tablespoon at a time, beating at high speed if using an electric mixer. Step 2: When all the sugar has been thoroughly incorporated and a stiff glossy meringue has formed, fold in the vinegar and vanilla essence. • Pile the mixture into a greased 20 cm (8 inch) china flan dish. 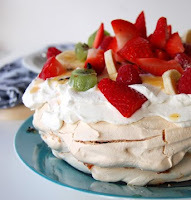 If using a gas range turn the heat to the lowest temperature just before putting the Pavlova in to cook for 1 1/2 hours. If using an electric oven cook the Pavlova at a low temperature (300 deg F / 150 deg C) for 45 minutes and then turn off heat and leave for 1 hour. When cooked, remove from the oven and cool completely. Pile cream on to Pavlova and decorate with seasonal fruit. 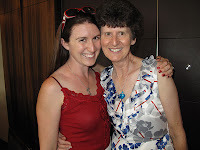 Thanks so much Christine - will be making it for Australia Day this year - looks delicious! Yummm. I think I'm going to make this on Australia day too. Love it! Mum made me one last night when i went over :) Delish!